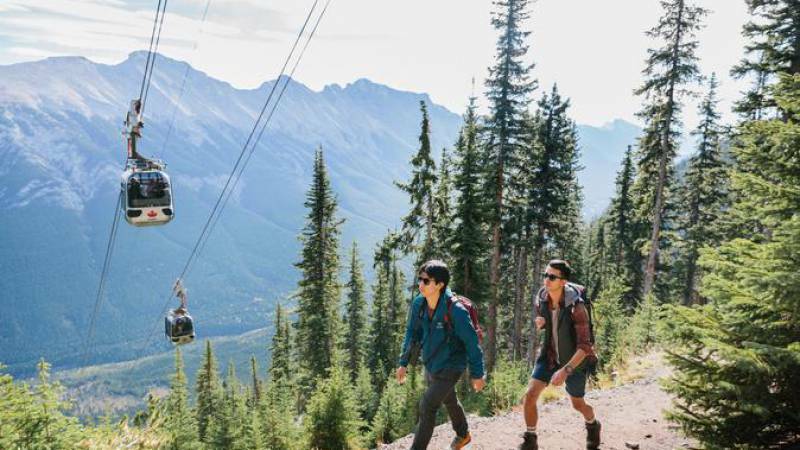 NAMBE 2018 attendees interested in a hiking or gondola ride excursion at nearby Sulphur Mountain will be provided with bus service from the Banff Centre on Sunday, September 30th beginning at 1:30pm. Return from Sulphur Mountain: 4:00 PM, 4:30PM and 5:00 PM. Hikers are encouraged to form hiking groups with fellow NAMBE attendees. The strenuous hiking trail follows a series of switchbacks to the summit ridge, and the upper terminal of the Sulphur Mountain Gondola. It is 5.3 km one way to the top, 655 m elevation gain, allow 2 – 2.5 hr. A network of trails along the ridge, and viewing decks at the gondola station, provide stunning views of the Bow Valley. From the top you can also follow a short trail to the historic Cosmic Ray Station. A hiker’s gondola pass can be purchased for the descent at the summit terminal. Alternatively, attendees may choose to ride to the top on the gondola for breathtaking views at the summit. The Banff Gondola is fully accessible to special needs individuals. As yet another alternative, attendees can walk along the river to Bow Falls. The river is a short distance downhill from the Banff Centre and the trail is on the opposite side of the river from the Banff Centre.